Religion is prevalent in world politics today, and international relation theory is at pains to understand and explain this phenomenon. This unique study aims to introduce political theology as an appropriate tool to the study of international relations. In accordance with the political theology of Carl Schmitt, which states that modern political concepts are secularized theological concepts, the work questions the "secular" foundations of contemporary international relations theory. Thus it reveals the Christian foundations of the discipline of international relations and delivers a critique of some of its most fundamental theoretical elements, such as its secular view of religion as part of the "irrational," its deification of the political form of the nation state, and its negation of theism in its understanding of responsibility in world politics. 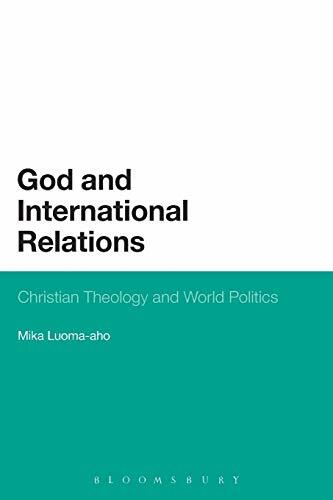 The result is a primer on how international relations and its studies have grown out of the political imagination of Christian theology. It will appeal to anyone interested in critical approaches to the field as well as in politics and religion, political theory, and political theology. Mika Luoma-aho is the he Head of the Department of Social Studies and a Lecturer in International Relations at the University of Lapland, Finland. He also serves on the Editorial Board of Kosmopolis, and has published in journals such as International Political Sociology, Geopolitics, and Journal of European Public Policy. He is the author of four books, including Europe as a Living Organism: Organicist Symbolism and Political Subjectivity in the New Europe (2002).